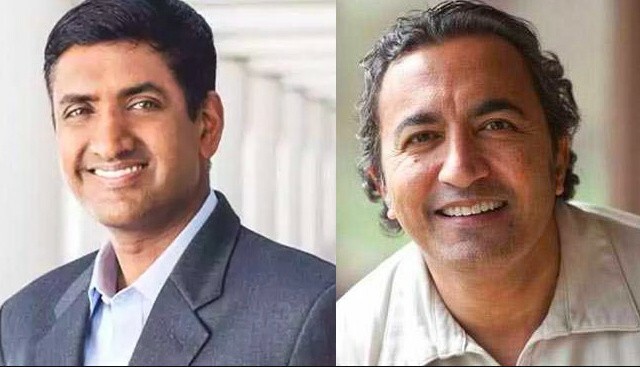 Two Indian-Americans Wins Congressional Primaries in California: Indian-American Congressmen Ami Bera and Ro Khanna won their respective primaries in California today and will run for the Congressional elections on November 6. Three other Indian-Americans Hirsh Singh, Goutam Jois and Peter Jacob are running for Congress in the New Jersey lost their Congressional bid at the primary level. New Jersey has a sizeable Indian American population. Mr Bera has bagged more than 51 per cent of the votes in the open primary. His nearest rival Andrew Grant from the Republican Party received 32.9 per cent of the votes. In California the top two candidates, irrespective of their party affiliation in the open primary head for the general elections for the House of the Representatives. Mr Khanna, who has entered the House of Representatives for the first time in the year 2017, has received an overwhelming 58.9 per cent of the votes in the open primary for the 17th Congressional District of California. His nearest rival Ron Cohen from the Republican Party received nearly 25 per cent of the votes. Comes from a strong Democratic background both Mr Bera and Mr Khanna are expected to win the Congressional elections in November. Despite running an exciting insurgent campaign, Vivek Viswanathan came up to short in his bid for California State Treasurer,” said Gautam Raghavan of the recently formed Impact Project, which is keeping track of some 80 Indian Americans running nationwide this election season. He received just 12.8 per cent of the votes as against his Democratic party colleague and Fiona Ma who had won the polls with 43.3 per cent of the votes polled. Indian-American Subham Goel has received just 0.1 per cent of the votes in the primary for the Governor of California. So, these are the points on the Two Indian-Americans Wins Congressional Primaries in California.